Update, April 23, 2019 (12:55pm ET): Fans of the Marvel Cinematic Universe in India are in luck. OPPO India’s Twitter account (via MySmartPrice) confirmed that the limited F11 Pro Avengers: Endgame edition will be available on April 26 for purchase from Amazon. We will add an Amazon link to the special edition phone when it becomes available. As the standard version of the OPPO F11 Pro retails for INR 24,990 in India, expect this special version to be priced slightly higher. In the meantime, check out the gallery to see what accessories come with the OPPO F11 Pro. Original post, April 15, 2019 (11:11am ET): Avengers Endgame, the long-awaited and highly anticipated Marvel Studios superhero movie epic, will be released in theaters on April 26 in the U.S. 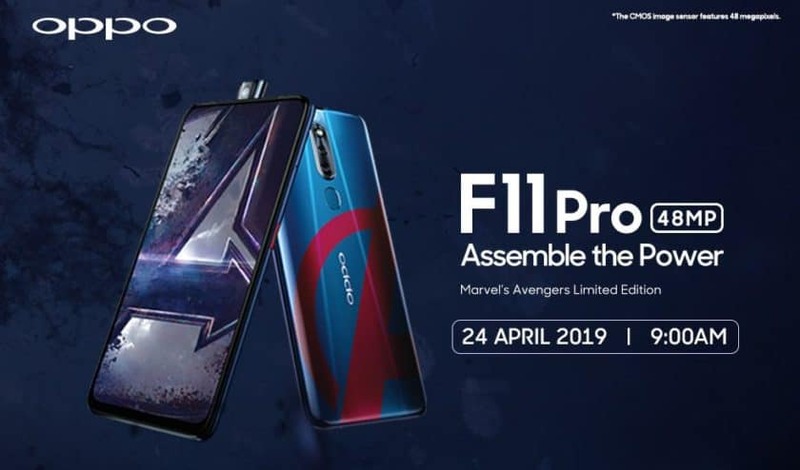 However, a couple of days beforehand, residents in Malaysia will be lucky enough to get their hands on a special Avengers Limited Edition version of the Oppo F11 Pro to help promote the film. According to SoyaChincau, the Oppo F11 Pro Avengers Limited Edition will officially go on sale in Malaysia on April 24. The special version of the will include a unique back color design. It will also feature the familiar Avengers “A” logo in bright red against a blue background. Other than the unique design on the rear of the phone, it appears that the Oppo F11 Pro Avengers Limited Edition will have the same specs as the high-end variant of the phone. It will include a 6.53-inch 2,340 x 1,080 display, 6GB of RAM, 128GB of onboard storage, and the Mediatek Helio P70 processor. It will also still have the 48MP and 5MP rear cameras and the 16MP front-facing camera that pops out of the top of the phone’s body. Finally, the phone is powered by a 4,000mAh battery with support for Oppo’s VOOC 3.0 fast charging. If you live in Malaysia, you will have to wait until next week to see what the price will be for the Oppo F11 Pro Avengers Limited Edition. There’s no word if there will be any other Avengers Endgame content (wallpapers, videos, etc.) that will be included with the phone. There’s also no word on exactly how limited this phone will be in terms of available units. This isn’t the first time that we have seen an Avengers-themed phone to hype one of the films in the series. OnePlus launched a special version of the OnePlus 6 to promote 2018’s Avengers Infinity War.